I'm finding that keeping up a Blog page is a little like feeding one of those Tamaguchi pets. At least I think that's what they were called. For a while every kid was obsessed with feeding and walking these little electronic devices that beeped when they needed attention. And died if you didn't take care of them. Every teacher was being driven crazy by having to confiscate the little creatures. However, for an artist, part of the point of doing the work is for other people to see it. Blogs seem to have that potential. But, they sure are hungry little beasts. This is a large painting. It's roughly 6' wide by 5' tall. The largest I've ever done and considering the size of my studio spaces, it's pretty big. It is a composite of photographs my husband took for me at a rodeo he was photographing for a client. At the time, I didn't take my own pictures. The whole cowboy scene is still very alive out in the Southwest. I have a hard time reconciling the Hollywood images with the real thing. 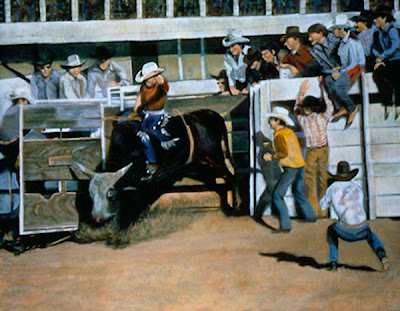 While this painting isn't exactly a spoof on cowboy art, it shows actual people caught in the moment. I hope you enjoy it. It lived in my closet for a long time, and is now hanging at the Curley School, in the Hallway gallery. Looks great there, but I'd love to give it a permanent home at some point. Maybe some real life cowboy would like it???? I'm delighted to be able to potentially show it to a wider audience on this blog.